REPORT OF SHIPBUILDING PROGRAM AS OF JULY 9, 1918. PRODUCTION OF SHIPS: With the completion and actual delivery of 283,000 d.w. tons of ships in June (a new high water mark in American shipbuilding) the production since January 1, 1918 has reached a total of 1,084,000 d.w. tons. Although this total represents only sea going steamers this tonnage exceeds the total output of all classes of vessels produced in American shipyards during the years 1915 and 1916 combined. On July 4th alone 95 ships were launched with a total of 474,000 d.w. tons. FABRICATING YARDS AND PLANTS: The four Government shipyards are rapidly approaching completion, the yard of the Submarine Boat Company at Newark being entirely finished. The Hog Island shipyard is 86% complete, and the yard of the Merchant Shipbuilding Company at Bristol, Pa., 96%. To assure a steady flow of material to the constantly expanding Government assembly yards, it has been found necessary to start construction on two new large fabricating steel plants at Pittsburg and Pottstown, Pa. The first launching from the Hog Island yard will occur probably early in September. Three ships were launched on July 4th at the Submarine Boat Company at Newark. This yard has reached the launching stage earlier than Hog Island because it is a smaller unit, and production operations are on a smaller scale. CHINESE OFFER: The Emergency Fleet Corporation has been approached by a special representative of the Chinese Government shipyard at Shanghai, which desires to build 10,000 ton steel ships for the United States. COMPETITION AMONG YARDS: In the National Shipbuilding Contest which has just been inaugurated, West Coast yards won all production honors, and awards for the month of June were as follows--Steel construction: championship pennant, Bethlehem Shipbuilding Corporation of San Francisco; 2nd, Skinner & Eddy Corporation, Seattle, Washington; 3rd Moore Shipbuilding Corporation of Oakland, California. Wood construction; championship pennant, Grant, Smith-Porter Yard, St. Johns, Oregon; 2nd Grant Smith-Porter Yard, Aberdeen, Washington; 3rd, Allen Shipbuilding Company, Seattle, Washington. Committee on awards gave consideration to every element in ship construction including efficiency, labor turn-over, daily attendance of workmen, percentage of accidents, natural handicaps such as weather, and rail congestion, difference in size of yard, difference in number of ways. RIVETING CONTEST: It has been found desirable to change the basis for rivet driving records from a daily to a monthly period. Such contests are regarded as better aids to increased production than short spurts. Union Iron Works plant at San Francisco reports, in month contest that yard, gang of Joe Munzie, kept a pace averaging 697-15/26 rivets a day. Efforts being focused on raising yard averages rather than individual percentages. CONCRETE SHIPS: The construction of concrete ships is being conducted in five Government yards which will have a total of 40 ways. Careful attention is being paid to designing, and as a result our experts state that the new 7500 ton concrete ships under construction will not sink even if two compartments are pierced by torpedoes. The “FAITH”, the first large concrete steamer to be actually put in operation, made a most successful trial trip, having encountered without serious damage, a severe storm with waves breaking over her deck. The “FAITH” is now making a voyage with lumber to Peru. PORT AND HARBOR FACILITIES COMMISSION: One of the first recommendations of this Commission was the establishment of new docks at strategic shipbuilding points, to facilitate repairs. Present docking facilities are reported as wholly inadequate for the new fleet. Some of the new ships, owing to speed in construction, immediately need repair. The construction forces of the Emergency Fleet Corporation will be used in building new docks, which, while an emergency need, will be of permanent value. DIVISION OF OPERATIONS: The policy has been adopted of excluding all German and Austrian born citizens from personnel of vessels operated by this Division, except in unusual cases. 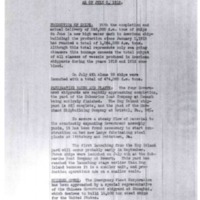 The Director of Operations reports his suspicions of the Rex Paint Company, New York, in connection with camouflaging merchant ships. He reports that the paint fades a short time after being applied, thus nullifying effects of camouflage system. Investigation has been ordered. Hurley, Edward N. (Edward Nash), 1864-193, “Report of Shipbuilding Program as of July 9, 1918,” 1918 July 9, WWP25069, World War I Letters, Woodrow Wilson Presidential Library & Museum, Staunton, Virginia.